One of Indonesia’s seven UNESCO World Heritage sites, Candi Borobudur is still one of the country’s most visited and recognized tourist attraction. The Buddhist temple complex dates back to the 8th century, but has been abandoned in the 14th century due to the decline of Buddhism and the mass conversion to Islam of the Javanese. The jungle surrounding Borobudur hid the massive complex, coupled with layers of volcanic ash from nearby Mount Merapi. It was brought to the world’s attention by Sir Thomas Stamford Raffles (the founder of Singapore), who was Java’s appointed governor during the British administration in the 1800’s. It wasn’t Raffles who found the monument, actually. It was H.C. Cornelius, a Dutch engineer, who hacked through the jungle to unearth structure, upon’s Sir Stamford Raffle’s orders. It took 11 years for the entire complex to be unearthed in 1859, but it was in the threat of collapse due to unstable foundation and thieves running off with “souvenirs.” Though the Dutch East Indies government took measures to safeguard and restore the monument, it was UNESCO’s efforts in 1973 to 1982 that left us with the Borobudur we see today. 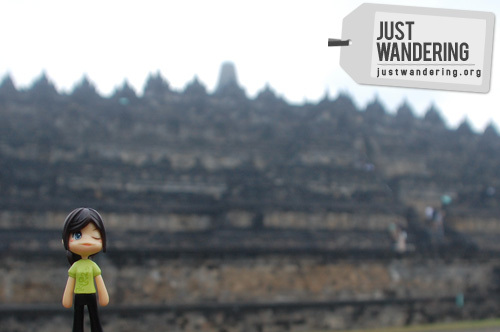 Unnamed Pinky and the Borobudur. Maybe I should name her Candy. Though 86% of Indonesia’s population are Muslim, Borobudur and the smaller Buddhist temples scattered nearby are revered by the 3.4% Buddhist populace, as well as Buddhist from all over the world. The temple is designed like a pyramid, rising high from the ground as it follows the natural slope of the hill it was built on. Visitors to the temple grounds are suggested to slowly make their way to the top, stopping at each landing to around the structure before going up the next staircase. By doing this, you’ll be able to see the bas reliefs that cover the façade. 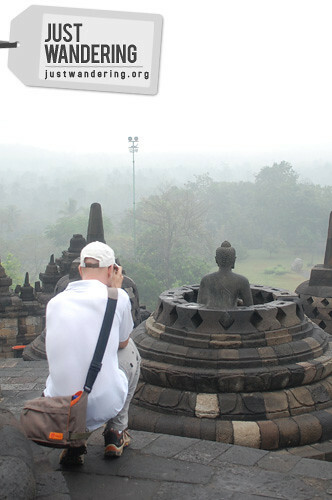 The upper levels of the Borobudur consists of a circular platform of stupas, culminating with a huge dome at the top. A Buddha in the lotus position sits in each perforated stupa, varying only with the positions of their hands. The temple is best visited in the early morning, when the weather is not yet too hot. Foreigners have to pay a $15 fee to enter the temple complex. 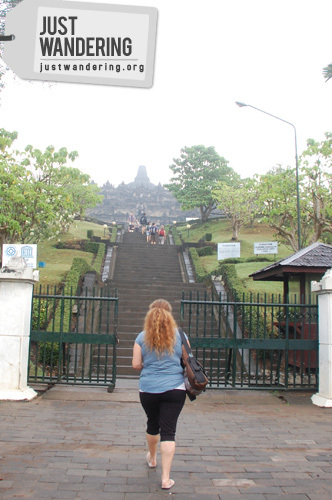 Borobudur is a 50 minute drive from Yogyakarta where most of the budget accommodations are. If you’re traveling solo, consider joining arranged tours as they can come out cheaper than if you will arrange for a separate transport. I believe a nice place to go. And better to be there during sunrise or sunset. It is! It’s very peaceful in the morning. Not as much tourists as the Angkor Wat. When were you supposed to go? If it was just recently, it was just as well, since Mount Merapi (which is visible from Borobudur) erupted. Where did you stay in Yogyakarta? My friend and I are planning to go there this June, we already booked tickets but still haven’t reserved in any hotel. Any suggestion? Thanks! I stayed at 1001 Malam.